Bike camp registration is opening early this year so that you can give the gift of camp this holiday season. Winter is here, but all this rain has got the staff of the Community Cycling Center dreaming of bike-riding fun in the sun in Portland! We can’t wait to be out there playing in the parks, cruising along the waterfronts, and reaching viewpoints atop our local volcanoes. We’ve got some great things in store for this summer and want to make them available to you in time for this holiday season. Each summer, kids flock to our shop with their bikes, imaginations, and goals to expand their geographic and personal horizons. Bike camp is more than just riding a bike, it’s about the freedom and independence you feel from a summer adventure on two wheels. Activities focus on safety, group and individual riding techniques, right of way, and basic hands-on maintenance skills. Yet the biggest lesson is the empowerment kids receive from a summer adventure on two wheels. All our camps include these essentials but some have a special focus. In 2016 some of these include our Crafty Cruisers Camp, Mechanics Camp, and Food Cart Camp. 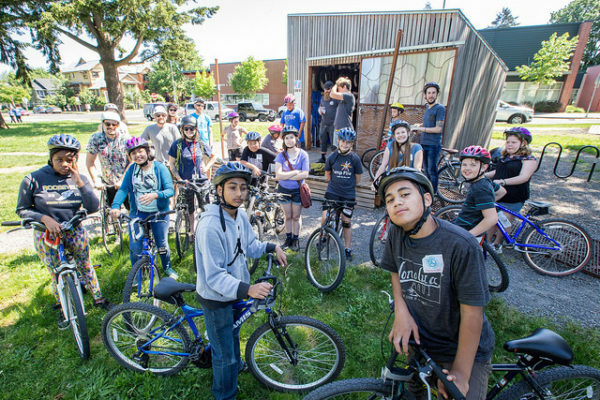 In Sellwood we’ve also added a Girls Cruisers camp as well as another Food Cart Freewheelers. We’re also proud to be partnering with the Parkrose Schools, IRCO, SEI, and Parks and Recreation to bring camp scholarship opportunities to kids in outer Northeast Portland. We hope to see you this summer! Bike Camp registration begins on December 6th.